Help a mage regain her sanity to obtain a recommendation from Leyawiin. "I shouldn't have to go through all this, just to get rid of her!" Speak with Dagail and agree to help locate her missing amulet. Ask Agata about Dagail's troubles. She says you should inquire with the other mages. After asking around and making note of Kalthar, return to Agata. She asks you to speak with Dagail once more. Determine that you can find a replacement amulet in Fort Blueblood. Fight through the fort and retrieve the amulet. After the ensuing confrontation, return to Dagail with the amulet and receive your recommendation from Agata. Speak with Dagail in the Leyawiin Mages Guild about your recommendation. She wants you to find her amulet for her and directs you to Agata. Speak with Agata about a Seer's Stone, which helped Dagail with her visions. Agata says to speak with the other mages in the guild to see if any of them knows where it might be. No one knows much, other than Kalthar, who seems to be bitter and glad the stone is missing. Return to Agata with what Kalthar said. She'll agree to keep an eye on Kalthar and wants you to speak to Dagail about her father. Dagail doesn't make too much sense, but apparently you must find the fort where Dagail's father was stationed, somewhere near Leyawiin. Fort Blueblood, a little ways southeast of town, is now marked on your map. The Fort is full of marauders. Make your way through until you find the main camp, containing a tough Marauder Warlord. Kill him for a key (or steal it from him) to open a nearby door. Within this area you'll find Manduin's Coffin, in which will be Manduin's Amulet, the one for which Dagail is looking. Once you find the amulet you'll be confronted by Kalthar, who will demand the amulet. He'll confess to stealing the amulet in an effort to see Dagail dismissed as leader of the Leyawiin Mages Guild and duly attack you. Deal with him and loot his key from his body. Return to Dagail and Agata with the amulet and the news of Kalthar to receive your recommendation (use the Seer's Stone topic to end the quest). After you defeat the marauders, make sure you loot their bodies before you take the amulet; after you encounter Kalthar, all three bodies in the final area will disappear along with their armor, items, etc. After the quest, Mages Guild members will start saying "Kalthar tried to ruin the Leyawiin guild. Just goes to show you can't trust a Necromancer, even if he claims to be 'reformed.'" When you turn in the amulet to Dagail, it is placed in her inventory and no longer a quest item, allowing you to pick-pocket it after the quest is finished. Do not leave Fort Blueblood without encountering and talking to Kalthar. He should come running at you right after you retrieve the amulet. If you leave beforehand, you will not be able to give the amulet to Dagail. If you speak to Dagail back at the guild, she will say that 'nothing has changed'. If you try to return to Kalthar, the door is locked, meaning you cannot continue the quest. This can be triggered if you lure the creatures in the final room outside to fight them but do not kill them. Even if you then return, you will probably not be able to talk to Kalthar, who still thinks that there are monsters that need to be killed. You may type: setstage MG07Leyawiin 70 into the Command Console to update the journal and allow the quest to continue as normal. Wearing Necromancer's Robes when Kalthar confronts you will result in him telling you to take them off instead of his normal dialogue, resulting in the bug mentioned above. Typing setstage MG07Leyawiin 70 into the Command Console will skip Kalthar's dialogue and allow the quest to continue as normal. The coffin containing "Manduin's Amulet" in Fort Blueblood will respawn after three days, meaning that it is possible to go back to the fort multiple times and retrieve multiple copies of the amulet. 10 I need to find an amulet so that Dagail will send a recommendation to the Arcane University for me. Agata may know more. 20 I need to speak with the mages in the Leyawiin guild hall, in case any of them have seen Dagail's amulet. 30 Kalthar seemed to know a great deal about the missing amulet. I should tell Agata what he has told me. 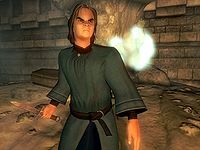 35 Agata has asked that I attempt to question Dagail about her father, to find out what his connection to the amulet may be. 50 I've arrived at Fort Blueblood. Dagail's father should be buried inside. 60 I have found the amulet Dagail needed. I should return it to her immediately. 70 I've defeated Kalthar, who was attempting to manipulate Dagail. I need to give her this information immediately. 100 Finishes quest I have delivered the amulet to Dagail. It is possible to use the console to advance through the quest by entering setstage MG07Leyawiin stage, where stage is the number of the stage you wish to complete. It is not possible to un-complete (i.e. go back) quest stages. See SetStage for more information. This page was last modified on 24 December 2014, at 15:40.